For the thread cutting tool, see Tap and die. A die is a specialized tool used in manufacturing industries to cut or shape material mostly using a press. Like molds, dies are generally customized to the item they are used to create. Products made with dies range from simple paper clips to complex pieces used in advanced technology. Forming dies are typically made by tool and die makers and put into production after mounting into a press. The die is a metal block that is used for forming materials like sheet metal and plastic. For the vacuum forming of plastic sheet only a single form is used, typically to form transparent plastic containers (called blister packs) for merchandise. Vacuum forming is considered a simple molding thermoforming process but uses the same principles as die forming. For the forming of sheet metal, such as automobile body parts, two parts may be used: one, called the punch, performs the stretching, bending, and/or blanking operation, while another part that is called the die block securely clamps the workpiece and provides similar stretching, bending, and/or blanking operation. The workpiece may pass through several stages using different tools or operations to obtain the final form. In the case of an automotive component there will usually be a shearing operation after the main forming is done and then additional crimping or rolling operations to ensure that all sharp edges are hidden and to add rigidity to the panel. Die block – This is the main part that all the other parts are attached to. Punch plate – This part holds and supports the different punches in place. Blank punch – This part along with the blank die produces the blanked part. Pierce punch – This part along with the pierce die removes parts from the blanked finished part. Stripper plate – This is used to hold the material down on the blank/pierce die and strip the material off the punches. Pilot – This will help to place the sheet accurately for the next stage of operation. Guide, back gauge, or finger stop – These parts are all used to make sure that the material being worked on always goes in the same position, within the die, as the last one. Setting (stop) block – This part is used to control the depth that the punch goes into the die. Pierce die – See pierce punch. Shank – used to hold in the presses. it should be aligned and situated at the center of gravity of the plate. Blanking: A blanking die produces a flat piece of material by cutting the desired shape in one operation. The finished part is referred to as a blank. Generally a blanking die may only cut the outside contour of a part, often used for parts with no internal features. Accuracy. A properly sharpened die, with the correct amount of clearance between the punch and die, will produce a part that holds close dimensional tolerances in relationship to the part's edges. 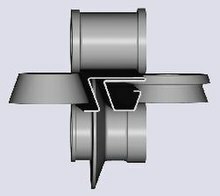 Bulging: A bulging die expands the closed end of tube through the use of two types of bulging dies. Similar to the way a chef's hat bulges out at the top from the cylindrical band around the chef's head. Extruding: Extruding is the act of severely deforming blanks of metal called slugs into finished parts such as an aluminum I-beam. Extrusion dies use extremely high pressure from the punch to squeeze the metal out into the desired form. The difference between cold forming and extrusion is extruded parts do not take shape of the punch. Roll forming: a continuous bending operation in which sheet or strip metal is gradually formed in tandem sets of rollers until the desired cross-sectional configuration is obtained. Roll forming is ideal for producing parts with long lengths or in large quantities. Hydroforming: Forming of tubular part from simpler tubes with high water pressure. Transfer die: Transfer dies provide different stations for operations to be performed. A common practice is to move the material through the die so it is progressively modified at each station until the final operation ejects a finished part. Progressive die: The sheet metal is fed through as a coil strip, and a different operation (such as punching, blanking, and notching) is performed at the same station of the machine with each stroke of a series of punches. Pillar set: Pillar set are used for alignment of dies in press movement. Steel-rule die, also known as cookie cutter dies, are used for cutting sheet metal and softer materials, such as plastics, wood, cork, felt, fabrics, and paperboard. The cutting surface of the die is the edge of hardened steel strips, known as steel rule. These steel rules are usually located using saw or laser-cut grooves in plywood. The mating die can be a flat piece of hardwood or steel, a male shape that matches the workpiece profile, or it can have a matching groove that allows the rule to nest into. Rubber strips are wedged in with the steel rule to act as the stripper plate; the rubber compresses on the down-stroke and on the up-stroke it pushes the workpiece out of the die. The main advantage of steel-rule dies is the low cost to make them, as compared to solid dies; however, they are not as robust as solid dies, so they are usually only used for short production runs. In the broadest sense, a rotary die is a cylindrical shaped die that may be used in any manufacturing field. However, it most commonly refers to cylindrical shaped dies used to process soft materials, such as paper or cardboard. Two rules are used, cutting and creasing rules. This is for corrugated boards whose thickness is more than 2 mm. Rotary dies are faster than flat dies. The term also refers to dies used in the roll forming process. Wire-making dies have a hole through the middle of them. A wire or rod of steel, copper, other metals, or alloy enters into one side and is lubricated and reduced in size. The leading tip of the wire is usually pointed in the process. The tip of the wire is then guided into the die and rolled onto a block on the opposite side. The block provides the power to pull the wire through the die. The die is divided into several different sections. First is an entrance angle that guides the wire into the die. Next is the approach angle, which brings the wire to the nib, which facilitates the reduction. Next is the bearing and the back relief. Lubrication is added at the entrance angle. The lube can be in powdered soap form. If the lubricant is soap, the friction of the drawing of wire heats the soap to liquid form and coats the wire. The wire should never actually come in contact with the die. A thin coat of lubricant should prevent the metal to metal contact. For pulling a substantial rod down to a fine wire a series of several dies is used to obtain progressive reduction of diameter in stages. Standard wire gauges used to refer to the number of dies through which the wire had been pulled. Thus, a higher-numbered wire gauge meant a thinner wire. Typical telephone wires were 22-gauge, while main power cables might be 3- or 4-gauge. ^ Degarmo, Black & Kohser 2003, pp. 430–431. ^ Twede, Diana; Selke, Susan E. M. (2005), Cartons, crates and corrugated board: handbook of paper and wood packaging technology, DEStech, p. 436, ISBN 978-1-932078-42-8, archived from the original on 2017-11-28. ^ Soroka, Walter (2008), Illustrated Glossary of Packaging Terminology (2nd ed. ), DEStech, p. 64, ISBN 978-1-930268-27-2, archived from the original on 2017-11-28. ^ Halmos, George T. (2006), Roll forming handbook, CRC Press, p. 4‑46, ISBN 978-0-8247-9563-4, archived from the original on 2017-11-28.